MOSCOW, Russia -- Moscow banned imports of most food from the West on Thursday in retaliation against sanctions over Ukraine, a stronger than expected measure that isolates Russian consumers from world trade to a degree unseen since Soviet days. A somber Russian Premier Dmitry Medvedev announces ban on Western food imports at the cabinet meeting in Moscow on Thursday. In eastern Ukraine, the Russian citizen who has led the rebel "Donetsk People's Republic" stepped down in favour of a local man, a move that could provide some faint new hope for peace. Kiev has long said it could negotiate with locals but never with foreigners it considers international terrorists. A Dutch recovery team called off its work at the site where a Malaysian airliner was shot down over rebel-held territory last month, saying escalating fighting had made the frontline location too dangerous. NATO's secretary general, visiting Kiev in a show of support for Ukraine, called on Russia to pull back from the brink of war against its neighbor. The Western military alliance says Moscow has massed troops on the border in preparation for a possible ground invasion. Moscow imposed a one year ban on all meat, fish, dairy, fruit and vegetables from the United States, the 28 European Union countries, Canada, Australia and non-EU member Norway. Russia has become by far the biggest consumer of EU fruit and vegetables, the second biggest buyer of U.S. poultry and a major global consumer of fish, meat and dairy products. President Vladimir Putin ordered his government to adopt the measures in retaliation against Western countries which imposed sanctions on Russia's defence, oil and financial sectors over its support for rebels waging an insurrection in east Ukraine. Putin had promised the measures would not hurt Russian consumers, which suggested he might exclude some popular products. 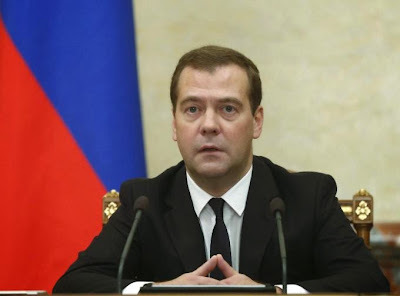 But in the end, the bans announced by his prime minister, Dmitry Medvedev, mentioned no exceptions. Agriculture Minister Nikolai Fyodorov acknowledged that the measures would cause a short-term spike in inflation, but said he saw no danger in the medium or long term. Russia would boost imports from other suppliers such as Brazil and New Zealand. White House economic adviser Jason Furman said the measures would hurt Russia's own economy. The U.S. Treasury said it was prepared to tighten its own sanctions on Russia further if Moscow continues aiding the Ukrainian rebels. The EU's executive Commission said it reserved the right to take action to retaliate against the Russian ban. Food represents a small fraction of Russia's overall imports from the West. But the ban will have a disproportionate impact on farmers in specific sectors in producing countries, and on Russian consumers, who will face higher prices and shortages with inflation already rising and the rouble falling. "The first casualties would be the domestic market. However it will have some implications for the farmers in the producing countries," Abdolreza Abbassian, a senior economist with the United Nations Food and Agriculture Organization, said. Russians have relished imported food since the fall of the Soviet Union, when year-round supplies of fresh fruit and vegetables arrived and ubiquitous cheap American frozen chicken quarters became known as "Bush's legs" after the then president. The ban affects all meat, fish, poultry, fruit and vegetables from the listed countries, but does not include other food items - mostly commodities such as grains, seed oils, sugar, coffee, tea and cocoa. Russia spent $25.5 billion last year on imports in the affected categories, $9.2 billion of it from the countries hit by the ban. It spent $39 billion overall on food, including $17.2 billion on all food items from the listed countries. The nascent middle class in Moscow, which buys Italian cheese and American beef at fancy supermarkets, will take a hit, but so will ordinary people who buy Polish apples and Greek cucumbers in street markets. Moscow may also ban Western airlines from flying transit routes though its air space. European carriers would spend more on fuel flying around Russia on the way to Asia, but Moscow would lose hundreds of millions of dollars in overflight fees. In another move that will annoy Washington, Moscow gave a three year residency permit to Edward Snowden, the former U.S. intelligence contractor who sought asylum in Russia after leaking details of U.S. surveillance programmes. The rebels in Ukraine have been led mostly by Russian citizens and armed with tanks, artillery and other heavy weapons that Kiev and the West say can only have come from Russia. They have declared independent "people's republics" in two industrial provinces of eastern Ukraine which they call "New Russia" - a term Putin has applied to all of Ukraine's south and east, where Ukrainians mostly speak Russian. Alexander Borodai, a combative Russian nationalist who led the self-proclaimed "Donetsk People's Republic", told a news conference he was stepping down in favour of Alexander Zakharenko, a local who leads a heavily-armed rebel unit. Borodai, who emerged as the main face of the rebels in recent weeks, personally negotiating with Malaysia's prime minister to hand over the "black box" flight data recorders of the downed airliner, said he would stay on as an adviser. Russian share prices rose after Reuters reported that he might step aside. The presence of Russians atop the rebel leadership has been seen as an obstacle to any peace process. NATO's Secretary-General Anders Fogh Rasmussen visited Kiev in a show of support for Ukraine, although the Western alliance has made clear it will not fight to defend the country, which is not a member and not covered by its mutual defence treaty. Kiev said Rasmussen had discussed a possible NATO fund to help Ukraine pay for defensive systems like command and control. NATO says Russia has massed 20,000 troops at the border and may be planning to declare a humanitarian mission as an excuse to invade. Rasmussen said Moscow should "step back from the brink" and not "use peacekeeping as an excuse for warmaking". Western countries imposed initially mild sanctions on Russia after it annexed Ukraine's Crimea peninsula in March, but tightened them after flight MH17 was shot down on July 17. The latest Western measures limit access by Russian state banks to global capital markets and also block imports of defence and oil industry equipment. Washington and Brussels say the Malaysian airliner was almost certainly shot down by an advanced anti-aircraft missile system supplied to the rebels by Russia. The disaster galvanised politicians, particularly in Europe, who had previously been reluctant to take strong action against a big trading partner. Dutch inspectors are trying to investigate the cause of the disaster and recover any personal effects and remains of bodies of the 298 victims of the crash that might still be left at the site. Their work was halted by fighting in the area, near the road linking the two main rebel bastions of Donetsk and Luhansk. "Over the past few days, the security situation in eastern Ukraine - including the MH17 crash site - has been getting progressively worse," Dutch Prime Minister Mark Rutte said. "In this light, it is currently not advisable to continue the repatriation mission." Ukrainian military spokesman Andriy Lysenko said seven more Ukrainian service members had been killed in the past day of fighting. Another Kiev military spokesman said a Ukrainian warplane had been shot down but the pilot ejected to safety. Kiev has lost numerous aircraft in recent weeks. Despite their advanced weapons, the rebels have steadily lost ground since June, leaving them mainly besieged inside two provincial capitals, along with hundreds of thousands of civilians who fear a full-scale government assault. Russia has announced military exercises near the border this week. On Wednesday, NATO said Moscow had amassed 20,000 troops near the frontier and could be planning a ground invasion under the pretext of launching a humanitarian mission. Putin has rallied Russians with relentless nationalist campaigns in state media against Ukraine and in support of the rebel cause, and Western officials fear he might invade to prevent a humiliating rebel defeat.